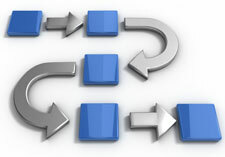 Every company is looking for more efficiency in their processes and the benefits that efficiency provides. Every company wants measureable results from improvement projects. That's where the lean experts - Industrial Management Services (IMS) - help companies thrive. With a proven track record of delivering tangible results, IMS' lean consulting services have resulted in significant savings and improvements for many client companies. All IMS lean consulting services and training are customized and personalized for each customer. Why Work with IMS for Lean Consulting? The average benefit provided to a typical IMS client is about 5 times the investment in realized value, including benefits from efficiency gains, process improvements, cost saving and new opportunities. IMS has worked extensively in traditional manufacturing environments, but also specializes in lean office improvements and non-industrial projects such as healthcare. The Lean process is recognized throughout the world for enabling companies to improve and operate more efficiently. The IMS Lean Experts have proven, documented results to demonstrate that they can guide their customers to these benefits. Please complete the contact form to inquire about IMS lean consulting services.